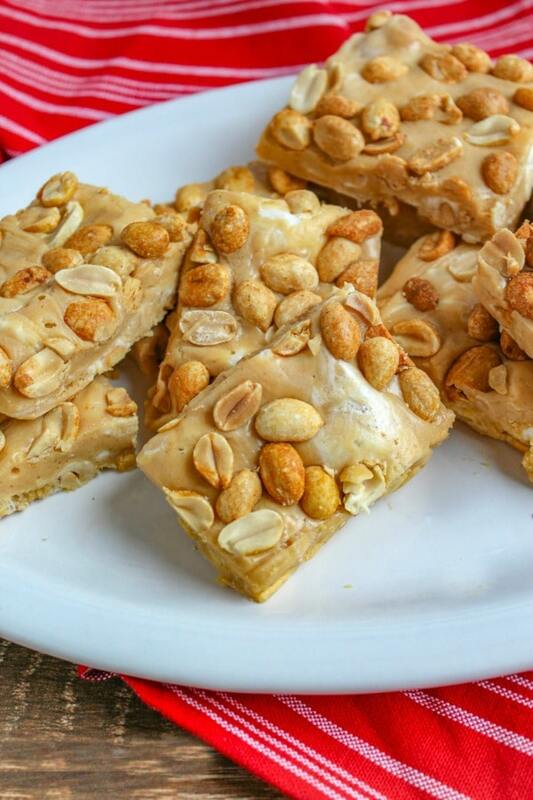 These easy no-bake Salted Peanut Roll Bars are the perfect combination of salty and sweet. They’re so good you won’t believe they’re made with only FIVE ingredients. Y’all today I’m sharing a special post with you. It’s special because I’m sharing a recipe my dear friend Allison Miller’s new cookbook, Untraditional Desserts: 100 Classics With A Twist. Allison is the blogger behind the recipes at Tornadough Alli where she shares recipes for fun family food and desserts all year long. I bet you didn’t know that often times bloggers get to know each other and they sometimes we even become great friends. That’s the case with my friend Allison we’ve become very close knit friends who talk daily about everything the weather (she lives in Minnesota burrrr…), blogging, our families and of course cooking. So when Allison asked me if I’d help her promote her cookbook I jumped at the chance to share it with y’all. Now, I’m not just saying this because I’m nice and Allison is a friend of mine these Salted Peanut Roll Bars are seriously A-MAH-ZING! 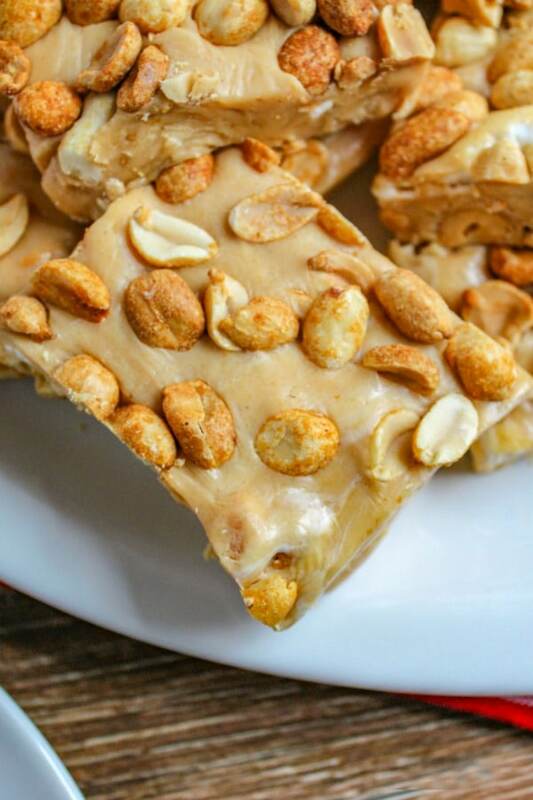 These Salted Peanut Roll Bars are reminiscent of the classic Salted Nut Roll candy or a Payday bar. Yet they are simple make and come together in less than 10 minutes. 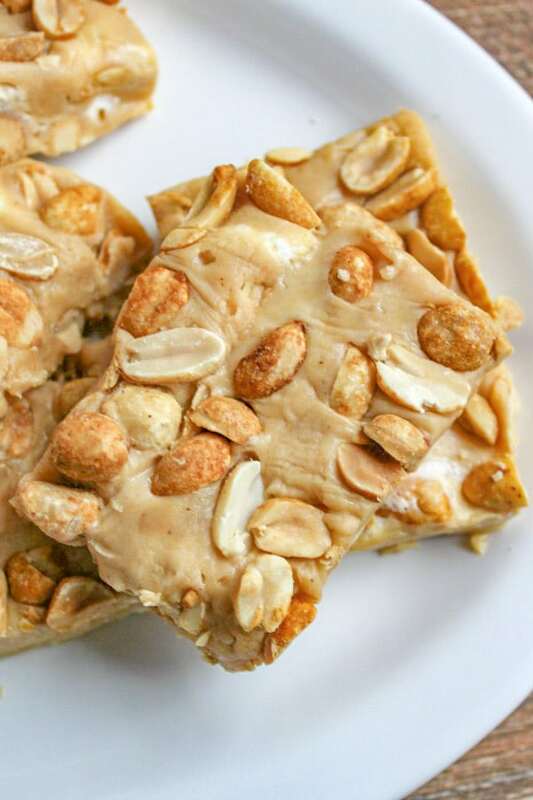 How do you make Salted Peanut Roll Bars? Begin by spraying the cake pan with non stick cooking spay and then lining the pan with half of the peanuts. Then over medium high heat meat the butter and then add the sweetened condensed milk and stir until combined. Next, add the peanut butter chips into the mixture stirring until melted. Then, pour in the marshmallows and stir into the peanut butter mixture until they are just puffy. When marshmallows are ready remove the pot from the heat and pour over the peanuts in the cake pan. Spread evenly across the pan. Put the remaining peanuts over the top of the mixture. 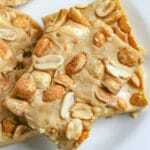 Lightly press the peanuts into the mixture to prevent them from falling off once cooled. Finally, place the pan in the refrigerator for about an hour. Cut the bars to desired size and serve. Keep bars in an air tight container in the fridge for up to five days. 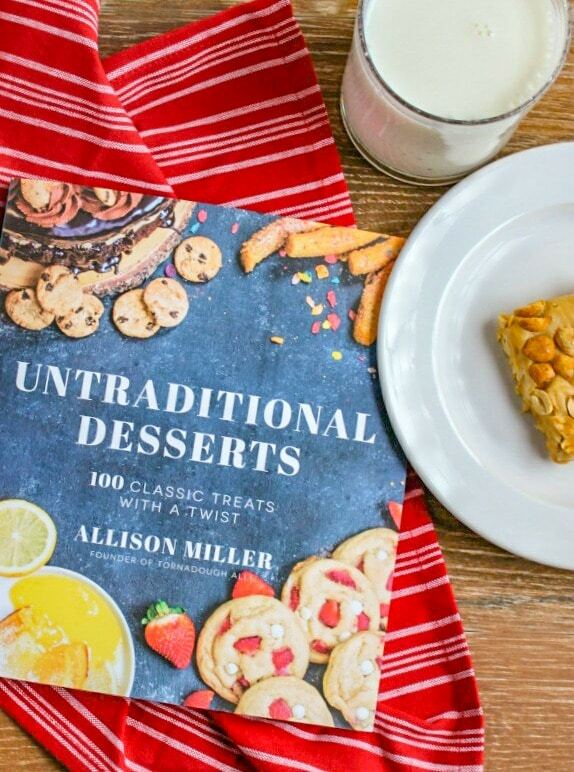 Allison’s cookbook Untraditional Desserts: 100 Classics With A Twist, is available on Amazon, Barnes and Noble or any where books are sold! Be sure to get your copy today. Oh! It makes a great Christmas present too! Over medium high heat meat the butter and then add the sweetened condensed milk and stir until combined. When marshmallows are puffy remove the pot from the heat and pour over the peanuts in the cake pan. Spread evenly across the pan.